New for a lively and quickly approaching Spring, Speed and Strength has come out with a pack of textile jackets. This new gear definitely has the bark to match their bite! We know Speed and Strength already has a rabid fanbase and they’re going to go wild over the Dogs of War lineup. Each of these jackets comes with removable Vault C.E. approved shoulder, elbow and back protection, which is a great feature because many jackets do not come with any back protection at all. 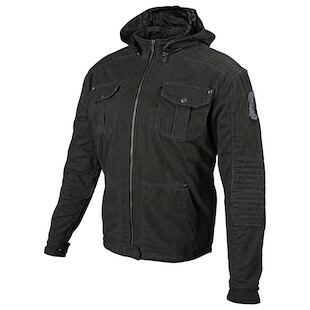 The military-themed Speed & Strength Dogs of War Jacket has a detachable hood and YKK zippers throughout. It is inspired by Speed and Strength’s partnership with the Warrior Dog Foundation which helps rehabilitate and find homes for ex-special forces military dogs. This jacket is unique in that it features a ruff looking cotton/polyester blend that should stand up to some abrasion around town. The new textile styles from Speed and Strength cover everything from high-speed havoc to around-town aggression. These guys have been making aggressive styles since they were founded five years ago. For some, they are a little too over-the-top, but you know what they say about staying on the porch.